The Crown will allow you to get in touch with your wild style while keeping your feet happy and warm. Designed for charging the whole mountain. The WOMEN´S CLOUD 5 LINER and WOMEN´S DUAL DENSITY FOOTBED provides pro-level performance, supreme support, and comfort. While the FLEX LINK DESIGN offers a flex so cozy and comfortable you will never want to take them off. Bootfitter's comments: We're excited to have Nitro boots on board this year. Featuring a lower volume fit, great build quality and a proven speed lace system, the Crown offers versatile and lasting performance! The Monarch is the perfect example of functional fashion, built for all day support and comfort while charging the entire mountain and designed to look as good as you do. Getting in and out of these toasty “snow-pumps” is easier than ever with our TLS 5 TWIN LACING SYSTEM, just pull up and lock in, it only takes 40 seconds to put both boots on! Loaded with time proven technology, RUBBER / EVA OUTSOLE, WOMEN´S CLOUD 4 LINER, and WOMEN´S ANATOMICAL FOOTBED, to give you a sure foothold, comfort, and warmth for freestyle progression. Built and designed for ladies by ladies! Bootfitter's comments: Slightly softer than the Crown, with a plusher liner, the Monarch offers a great blend of comfort and precision. 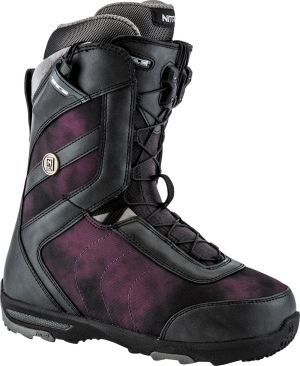 Nitro's lacing system makes getting your boots on and off super quick and easy!